About "Volume of composite solids worksheet"
Worksheet on volume of composite solids is much useful to the students who would like to practice solving volume problems on composite solids. 1. Allie has two aquariums connected by a small square prism. Find the volume of the double aquarium. 2. The figure is composed of a rectangular prism and a triangular prism. Find the volume of the figure. 3. The figure is composed of a rectangular prism and a triangular prism. Find the volume of the figure. The figure is composed of a rectangular prism and a triangular prism. Find the volume of the figure. Volume = 5070 cubic in. 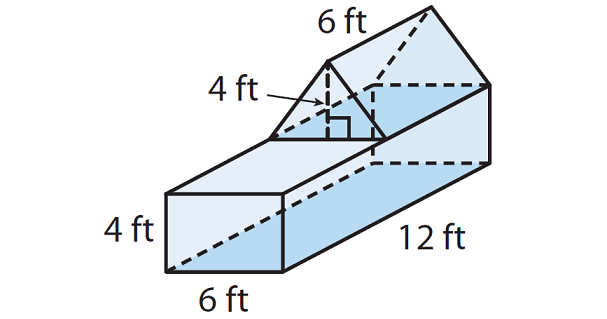 Find the volume of the triangular prism. Volume = 1755 cubic in. Add the volumes of the two parts of the aquarium. V = 6825 cubic in. The volume of the given figure is 6825 cubic in. Volume = 288 cubic ft.
Volume = 72 cubic ft.
V = 360 cubic ft. The volume of the given figure is 360 cubic ft.
After having gone through the stuff given above, we hope that the students would have understood, how to find volume of a composite solids.